Join Folkmoot for an evening of locally-grown, internationally-themed delicacies for the Sunday Soiree Friendship Dinner on Sunday, July 22, 2018 beginning at 5:00 pm on Virginia Avenue in Waynesville. Celebrating the second year of the Soiree, Folkmoot has invited the chefs of the Blind Pig Supper Club to share an array of street foods from eight world cultures, alongside four youth cultural groups practiced in Appalachian, African, American Jazz and Cherokee inspired entertainment. After dinner, meet and greet Folkmoot’s international performers over dessert! The Blind Pig is a local organization of reputable chefs, cooks, servers, designers, artists, farmers, foragers and hunters. Menus and dinner concepts are drafted upon ideas that inspire, and like Folkmoot, go beyond and above conventional standards. Blind Pig have strict food philosophies, as you will find in their use of local and seasonal vegetables, meats, and seafood on their menus. Blind Pig has hosted hundreds of concept-charity dinners since their inception and garnered local and national media attention and awards for its array of cultural preservation, documentation, research and philanthropy through their distinct merging of food and experience. 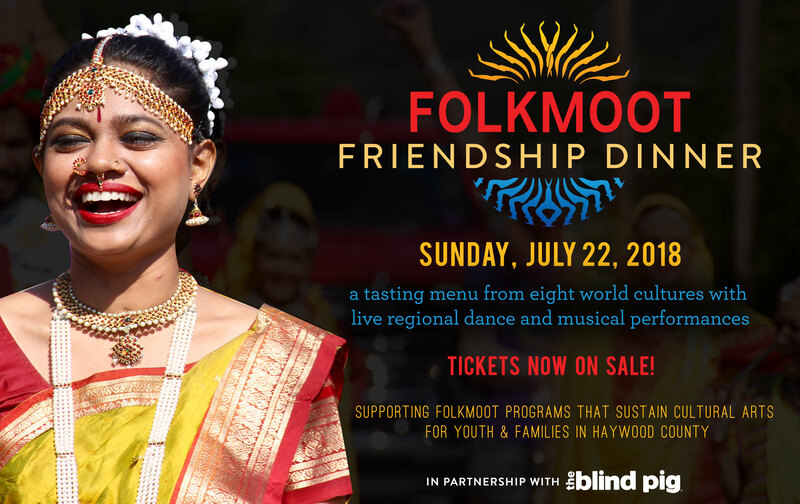 Folkmoot is honored to partner with Blind Pig for the Sunday Soiree dinner which will feature the foods of the countries of all visiting international groups. Youth performers during the Soiree include Lillian Chase, a prodigious 14 year-old bluegrass and ballad singer. Lillian’s list of accomplishments include performing at Merlefest, Song of the Mountains, and recording her own debut album. Dvdaya Swimmer is a impressive young Cherokee voice who will wow the crowd with a musical piece sung in the Cherokee language. The Urban Arts Institute is based in Asheville. UAI’s mission is to provide an outlet for artistic expression and mentorship to youth in Asheville’s urban community. UAI students will perform a dance number sure to excite and inspire. The Tuscola High School Jazz Band will offer a lively show comprised of American Jazz standards. These local students are highly practiced and musically skilled and are sure to impress. Youth performances at the Sunday Soiree have been made possible by Folkmoot contributor, Thomas Ezell. Tickets for this event can be purchased in advance, $65 for adults, $30 for kids, at Folkmoot.org or by calling (828) 452-2997. Ticket sales and contributions support Folkmoot programs that sustain cultural arts for youth & families in Haywood County.